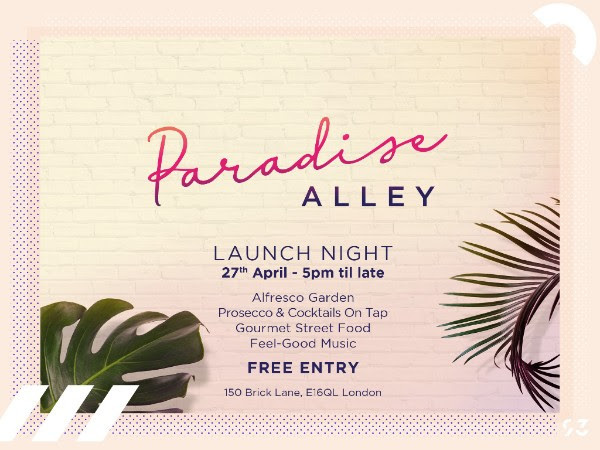 London’s 93 Feet East will launch their alfresco courtyard area dubbed Paradise Alley on Friday 27th April. The Brick Lane venue will offer drinks, street food and DJs every Friday from 5pm - 1am, with disco balls, LED lights and chill out areas. Cocktail van Fizzy Rascal will provide prosecco, margaritas and dark & stormy’s on tap. Street food will be provided by Steel Smoking, Nanny Bill’s and Greenbox with more to be introduced soon. Paradise Alley’s soundtrack will be a mixture of disco and feel-good music, with Tim Ross (Dirty Laundry) and Strangers in Paradise’s Scott Martin behind the decks from 7pm until 10pm when the party kicks off inside 93 Feet East’s main bar. Entry to Paradise Alley will be free. For details go to 93feeteast.co.uk.